Extended travel coilover front suspension kits are available for 1964, 1965, 1966, 1967, 1968, 1969, 1970, 1971, 1972, Chevelle, El Camino, Monte Carlo, Malibu, and other a-body applications from Global West Suspension. When to use Coilover or Stock: The lower control arms are designed to support a standard shock and spring combination. In many cases, keeping the stock shock and spring configuration gives you more travel for lift than a coilover. The advantage using a coilover is adjustable ride height and easy spring rate change; however, if the car requires a lot of lift, a coilover can restrict the travel. The decision of buying a coilover should be based on how good the rear end is working. Many times people will buy front end parts for a rear end problem. So what is the answer? If you have to tie the front end down to get the car to perform properly, then you can get away with a coilover because you do not need the upward travel. If you need every inch of movement you can get in the front end to make the rear end hook, then you should stay with the stock spring and shock combination. If you are planning on lowering your car and running big tires for pro-touring or just achieving the desired look, extended travel front end kits are something you should be looking at. The extended travel lower control arm is designed for those who want to lower their cars further then 1-1/4 inches and not use a dropped spindle. The shock mount in the arm is lowered to allow for more shock travel at a lower ride height. 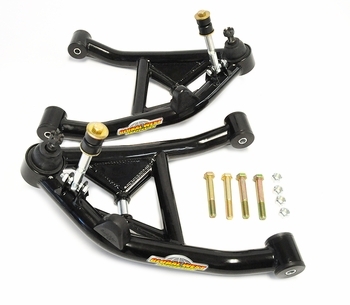 We recommend this control arm for ride height from 1-1/4 to 2-1/4 below stock ride height. You can run these with a dropped spindle for additional ride height. You should know these arms will not allow you to go back to stock ride height unless you go to a longer shock absorber. If you are planning on lowering your car and running big tires for pro-touring or just achieving the desired look, extended travel front end kits are something you should be looking at. As coilover suspension grows in popularity and ride heights are getting lower and lower, suspension travel is becoming more limited. Dropped spindles lower the car down but can reduce the amount of back space of the rim depending on the rim size because the center line of the spindle is raised two inches and the steering tie rod ends are in the stock location. The tie rod ends up hitting the tire or inside of the rim. If this happens you will have one of two choices, either run a smaller rim width and tire size or step up too in most cases an 18 inch or larger rims. You can use coilover shocks that plug into the stock frame using a conical wound spring; however, you can run out of shock travel if you get into a 2 inch drop scenario and you drive aggressively. You need more travel and much higher spring rates. That is why The extended travel lower control arm was designed. The shock is mounted lower in the control arm extending the shock length so there is more travel at the lowered ride height. The sway bar mounting plate adds support to the ball joint area. Straps are used around the bushing housings, strengthening the housing to the tube. Del-A-Lum bushings are a direct replacement for rubber or polyurethane control arm bushings. They are perfect for street or race applications. This unique design provides smooth performance without squeaks or bind. Designed to last over 100,000 miles. Whether on the street or on the track, Del-A-Lum bushings will give you optimum performance and control. Standard ball joints are used so they can be serviced anywhere. Extended travel coilover front suspension kits are available for 1964, 1965, 1966, 1967, 1968, 1969, 1970, 1971, 1972, Chevelle, El Camino, Monte Carlo, Malibu, and other a-body applications from Global West Suspension. The lower control arms are designed to support a standard shock and spring combination. In many cases, keeping the stock shock and spring configuration gives you more travel for lift than a coilover. The advantage using a coilover is adjustable ride height and easy spring rate change; however, if the car requires a lot of lift, a coilover can restrict the travel. The decision of buying a coilover should be based on how good the rear end is working. Many times people will buy front end parts for a rear end problem. So what is the answer? If you have to tie the front end down to get the car to perform properly, then you can get away with a coilover because you do not need the upward travel. If you need every inch of movement you can get in the front end to make the rear end hook, then you should stay with the stock spring and shock combination. The extended travel lower control arm is designed for those who want to lower their cars further then 1-1/4 inches and not use a dropped spindle. The shock mount in the arm is lowered to allow for more shock travel at a lower ride height. We recommend this control arm for ride height from 1-1/4 to 2-1/4 below stock ride height. You can run these with a dropped spindle for additional ride height. You should know these arms will not allow you to go back to stock ride height unless you go to a longer shock absorber. As coilover suspension grows in popularity and ride heights are getting lower and lower, suspension travel is becoming more limited. Dropped spindles lower the car down but can reduce the amount of back space of the rim depending on the rim size because the center line of the spindle is raised two inches and the steering tie rod ends are in the stock location. The tie rod ends up hitting the tire or inside of the rim. If this happens you will have one of two choices, either run a smaller rim width and tire size or step up too in most cases an 18 inch or larger rims. You can use coilover shocks that plug into the stock frame using a conical wound spring; however, you can run out of shock travel if you get into a 2 inch drop scenario and you drive aggressively. You need more travel and much higher spring rates. That is why The extended travel lower control arm was designed. The shock is mounted lower in the control arm extending the shock length so there is more travel at the lowered ride height.